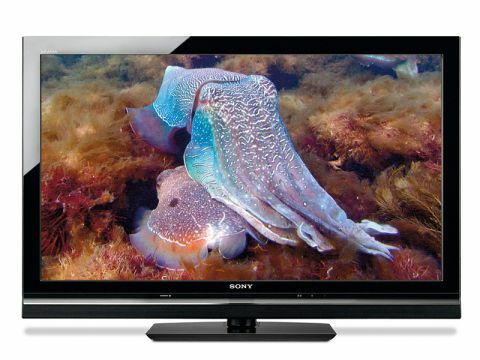 The Sony KDL-37W5500 is part of the Bravia W5500 range and sits squarely in the middle of Sony's current LCD TV lineup. Other models in the range include the KDL-32W5500 and the KDL-40W5500. But while it's nothing special aesthetically, its specification is pretty darn good. It's part of the popular Sony Bravia KDL W5500 series of LCD TVs which also includes the 32-inch and 52-inch W5500 models. The 37W5500 is full HD, of course, but more importantly are its picture processing tricks, especially Bravia Engine 3 and MotionFlow 100Hz. The former, as most of you will probably know, is the latest version of Sony's long-respected, multifaceted Bravia Engine system, while the MotionFlow processor combines frame interpolation with 100Hz scanning to add clarity and fluidity to motion reproduction. Another significant string to the TV's bow is the Ethernet port included among its connections, which permits access both to files on a DLNA PC and Sony's AppliCast online service. In truth, though, we're not sure that AppliCast's painfully limited set of applications should be called a 'service'. The 37W5500 also enjoys a reasonably plentiful series of picture adjustments, accessed via some pleasant, if at times slightly inscrutable, onscreen menus. As fans of the 40in variant, we'd expected to fall for the 37in model as well. Inexplicably, though, it just doesn't seem quite as irresistible. This is largely because the set's black level response isn't as refined as that of the 40W5500, with more of a blue/grey tinge to dark picture areas, and less apparent detail available in dark backgrounds. We also don't think that the 100Hz system here is quite as astute at removing motion blur from the picture, leaving minor traces of blurring with both standard and high-definition sources. Since the processor is the same in both models, we can only presume that these inconsistencies are down to differences in the design of the 37in panel. Not surprisingly, though, plenty of familiar Sony strengths remain with the 37W5500's pictures. Its colours, for instance, combine fearsome intensity with some superbly natural tones and more or less immaculate blends. Its HD pictures are outstandingly sharp too, except for where the minor motion blur steps in. But the BE3 system also helps the 37W5500 upconvert standard definition, which it translates to the screen's full HD resolution very tidily indeed. With some solid and reasonably potent audio on hand, together with negligible trouble from Sony's occasional backlight consistency issue, we'd say that in the end the good things about the 37W5500's pictures clearly outweigh the bad. Though whether you think this somewhat qualified praise counts as quite successful enough on a TV costing £950 probably depends on how much of a fan of the Sony brand you really are.